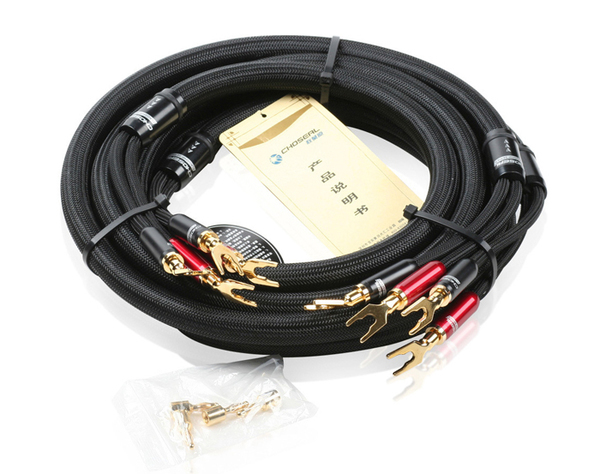 Choseal LB-5108 Single Crystal OCC 6N Flagship audiophile Hi-Fi speaker wire with U-Plug. OCC (Ohno Continuous Cast) is the name given to the casting process developed Professor Ohno in Japan to help defeat annealing issues and virtually eliminate all grain boundaries in copper or silver with a unique patented process. The OCC casting method uses specialized heated moulds in order to draw a single crystal up to 125 meters in length. With only a single crystal in very long lengths, there is an unimpeded free path for the best possible signal transfer. Along with this superior single long crystal structure, OCC provides copper and silver with the least possible oxides and other impurities. In comparison to OCC, there are other lower grade coppers such as OFC with a multitude of grain boundaries and other impurities. 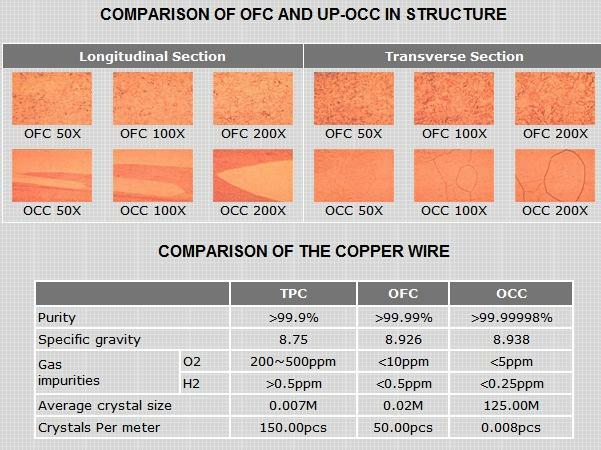 OFC (Oxygen Free Copper) has around 400 crystals per foot and despite its name has an oxygen content of about 10 ppm. OFC has many grain boundaries per foot that the signal must route around and pass. The question ultimately comes down to the following: Would you rather have your signal flow in a path with many cracks, bumps and obstacles in the way (OFC) or flow along a completely unimpeded free path with the lowest possible impurities (OCC). From our view the choice is simple, and the bottom line is most top cable designs utilize OCC as it gives the absolute purest base platform to get that much closer to true absolute transparency. Plug can be replace either U-shaped or banana plug. Pack comes with 4 interchangeable banana plugs. 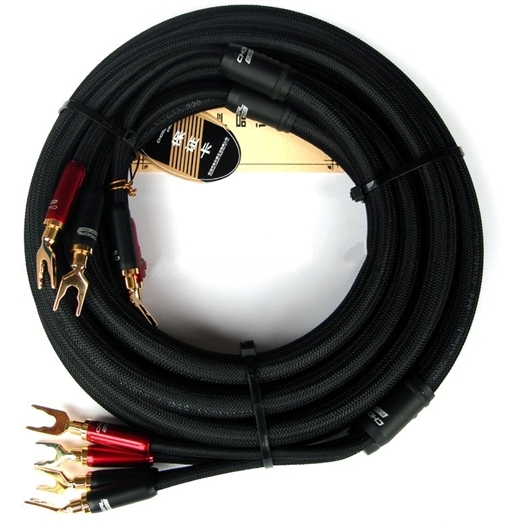 Very suitable for bi-wiring, 1 pair of wire can bi-wire 1 speaker. Production of single crystal copper (referred to as the OCC) wire for sound, and is a major breakthrough in recent years, audio wire manufacturing. Scientific evidence: a high-purity single crystal copper is copper (purity up to 6N), its whole root of copper rod by only one or a few grains, no "boundary" or less between the grains and grain " grain boundaries " has a very high signal transmission performance. In comparison, to the widely used production of oxygen-free copper audio cable (refer to OFC), a number of its internal grain "grain boundaries" can cause signal distortion, refraction/reflection and attenuation, resulting in signal transmission performance loss compare to the single crystal copper OCC cable. Multi-Unit 6N OCC single crystal copper as conductor, screw geometry design, add in-line multi-strand nerves of the role played back, with the original 24K gold-plated lockable U-type plug, particularly strong bass playback and sharp dynamic of both advantages, sound particularly vivid. Under this line conductor can be notice, background is clean, open transparency, sound quality tends delicate, sweet, warm tone bias, smooth, the overall performance is easy, comfortable and never tiring. 1. Speaker cable input / output is"+" ----> "+", "-" ---->"-", the Red is "+", Black is "-". 2. The speaker cable is directional, and there is marked arrow indicating, amplifier ----> speaker . Follow this connection for best results. Serious buyer only. Kindly make appointment with me if interested. Promotion Price Now!!! Limited Stock !!! hi, is this biwire only? morpheuse wrote: hi, is this biwire only? Hi thanks for your interest. There are 1 pair (2 pcs) of single wiring speaker wire inside the box. For bi-wiring you need to buy 2 pairs (4pcs) of these to do the bi-wring configuration. Hopes this clarify your doubts. If you interested please whataspp/sms/contact me at 0122163733. 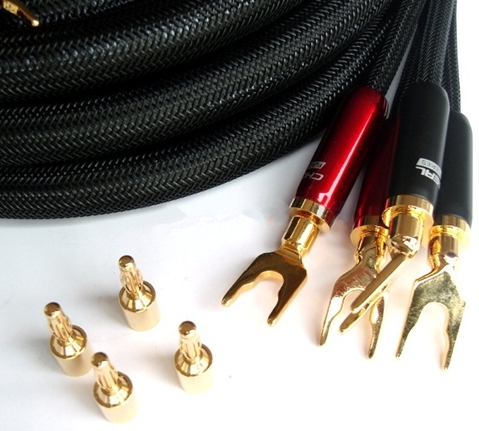 What is the gauge in awg?